I've tested with all three genetic genealogy companies. I've had family members test, too (Yes, both of my grandmothers have spit in little tubes!). I understand that DNA can tell me who I am related to, and that different types of DNA (Y, mitochondrial, and autosomal) can point at shared common ancestors within the parameters of each particular type of DNA. But how do I break through brick walls with DNA exactly? How do I triangulate all of the data to get at meaningful information? These questions drove me to attend the inaugural 2014 International Genetic Genealogy Conference sponsored by the Institute for Genetic Genealogy (i4GG). The weekend proved to be a phenomenal education in genetic genealogy. Friday featured two-hour presentations by each of the three key players in the DNA ancestry field: 23andMe, Ancestry.com, and FamilyTreeDNA. All three walked through their products, took questions from the audience, and even hinted at future offerings. A couple even took audience feedback to heart, and one faced considerable audience criticism for their current refusal to share chromosome information that's critically important to confirming genetic relationships. 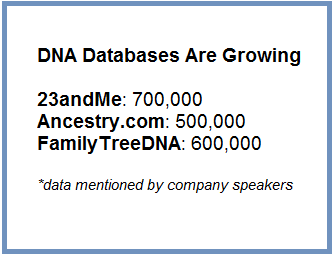 Across all presentations, I was struck by the increasingly exponential popularity of genetic genealogy. Keynote speaker Dr. Spencer Wells, a National Geographic Explorer-in-Residence and Director of the Genographic Project, noted that it took 11 years for the one millionth consumer to complete a personal DNA test in 2013. By mid-2014, the second millionth consumer had already submitted their DNA sample. Dr. Wells surmised that direct-to-consumer DNA testing is the "most disruptively radically changing technology in history." This isn't an understatement. We're still discovering the ways in which DNA can advance our genealogy. During his presentation on Using Free Third-Party Tools to Analyze Your Autosomal DNA, Blaine Bettinger referenced a tool that allows users to analyze their inherited DNA to artificially reconstruct an ancestor's DNA. It's reminiscent of the March 2014 news that scientists were able to use DNA to create "crude 3D models of faces." Clearly, this isn't grandpa's genealogy of yesteryear. We're not just talking about DNA helping to match us with distant cousins. We're talking about identifying DNA lost to time and reconstructing great-granddad's face! Maybe I'll finally be able to identify all of those old unlabeled family photos. I left the conference exhausted (12 hour days, people! ), but incredibly excited. There were many great sessions that provided insight into my initial questions about how to break down brick walls through triangulation. But I was most struck by the fascinating discoveries continued DNA research has in store for the future of family history, and how everyday genealogists (citizen scientists, really) are leading the practical application of the science to genealogy. As event organizer CeCe Moore noted, "the discoveries that we'll make are in our hands."